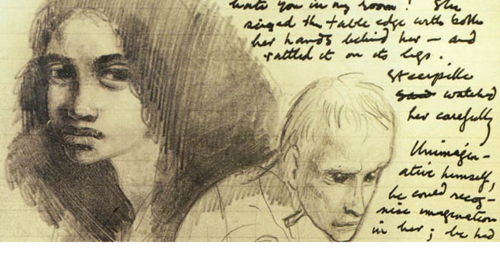 We were introduced to the Gormenghast novels when we were young and I was hooked. I like to read Gothic if somewhere tropical and vice versa – god I even seek escapism from paradise! These are the books I would refer to for baby name inspiration – and that probably says it all: Titus, Scarlet, Steerpike, and less so Swelter the chef and Dr Prunesquallor. Peake, a god of Gothic literature was a complex and troubled character but he managed to push through an illustrated trilogy between 1946 and 1959. But wait – a fourth book has come to light! This event at the British Library celebrates the first reading of Titus Awakes, the recently unearthed fourth in the series with contributions by China Miéville, Sebastian Peake, John Sessions, Brian Sibley and other special guests. An evening of words, memories and images with Peake’s associates, experts and family members. Speakers on the night will include Fabian Peake, Sebastian Peake, Clare Penate, Brian Sibley, Hilary Spurling and others, with a specially filmed contribution by Michael Moorcock.